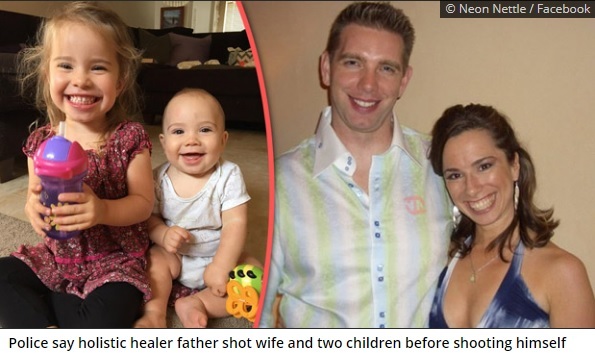 Police say holistic healer father shot wife and two children before shooting himself. An entire family of four, who owned a holistic healing company that fought Big Pharma, has been found dead at their home. Police responded to reports on Saturday and discovered the bodies of Jason and Annie Fairbanks along with their two children who had all died of gunshot wounds in their Scottsdale, Arizona residence on Friday.Local police have ruled the deaths as a "murder-suicide" and claim that 39-year-old Mr. Fairbanks shot and killed his wife Annie, 39, along with his 3-year-old daughter and 9-month-old son before shooting himself in the back of the head. Within hours of their bodies being discovered, a spokesman for the Scottsdale Police Department, Sgt. Ben Hoster, made a statement claiming that Jason Fairbanks most likely killed himself and his whole family because of "money woes." 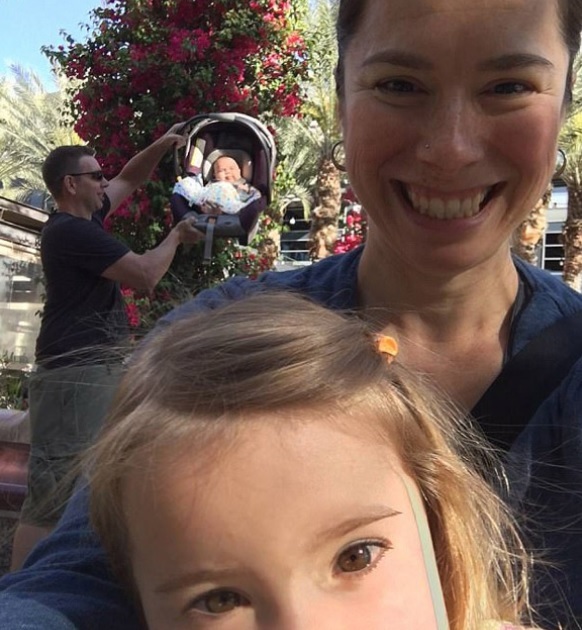 Doctor Annie Fairbanks Ph.D. and her husband Jason owned the well-respected Macrotherapy Physical Therapy & Rehabilitation clinic in Old town Scottsdale, and the family resided in a two-story stucco home in a quiet upper-middle-class neighborhood.Dr. Fairbanks was one of the most well-respected alternative healers in the US and gave regular talks at holistic healing conferences and worked hard to expose the corruption of Big Pharma and educate people of the benefits natural nutritional treatments. She was very outspoken on the conspiracy behind the large pharmaceutical companies and tried to expose how chemotherapy actually caused cancer cells to spread. She publically backed the research of Dr. Gonzalez, who works to reveal "the truth behind chemotherapy," and advises those fighting those fighting cancer to consider alternative options for treatment, especially holistic and nutrition-based protocols. The late Dr. Fairbanks also helped to promote the exposé of the American Heart Association that revealed that is supposed to fight heart disease and stroke by funding research, promoting certain public health policies, and providing education to the public. Revelations actually confirmed that AHA is secretly funded by corporate sponsors, which included Subway, Cheerios, and Bayer.In addition, the AHA allows companies to purchase a “seal of approval”, known as the Heart Check Program, that can be put on certain food products that meet specific criteria. Some of these products include Honey Nut Cheerios, Orange Juice, and V8 Fusion.The products endorsed by this program are generally high in refined carbohydrates and contain a lot of sugar, with the endorsements only being limited to the companies who can afford to pay the fee for the “Heart Check” label to use on their packaging. According to Arizona Central, The four members of the Fairbanks family were found in the home after Jason and Annie Fairbanks failed to show up to work and a concerned co-worker went to check on him. According to Sgt. Ben Hoster, when the co-worker entered the home, they discovered the bodies. Jason Fairbank's sister, Laura Fairbanks, described her brother as a "protector" and a hard worker who never let the stress of work get to him. She said that he loved his family and "could never harm anyone." The solemn sister said in a statement, if the family had money troubles, "I just wished he had asked for help." "He wasn't a bad person ... He loved his family so much. "Jason and Annie got married and started a family a year and a half after they moved in together. "Boy, (Annie) loved those kids ... She loved them so much," Laura added. She remembered her sister-in-law as the kind of person who "just made you feel all right" in her presence. "Jason could make people laugh in ways you never thought you could ... He was an extraordinary big brother." A friend of Dr. Fairbanks spoken out to say she disagrees with the police ruling, however, and suspects foul play. Tina Marie St.Cyr said in a statement that she's extremely suspicious about the Fairbanks' deaths, saying: "I guarantee this case is NOT a murder suicide. "I knew Annie from Holistic Conferences ... "
This sounds very, very fishy! "God bless you Annie and your beautiful family. "I am so sorry."Dr. Fairbanks and her family are just the latest in a long line of mysterious deaths of alternative healers and holistic health practitioners.In July, holistic cancer doctor and Big Pharma activist, Justine Damond, was shot dead on her doorstep by a rogue police officer after she reported an assault taking place in an alleyway near her home. In August, world-renowned holistic researcher, and author Ann Baroch, 51, was shot an killed in Los Angeles. n September of this year, a doctor who ran the Holistic Psychiatrist Clinic in Wichita, Kansas was stabbed to death in his practice.September also saw the deaths of family GP, Dr. Peter Cianfrani, who tried to warn families on the dangers of vaccines, and Dr. Sonya Kay Forbes, who was researching the benefits of using cannabis as an alternative to mainstream medicine, both of whom were found dead in suspicious circumstances. Sadly these deaths are just a handful of examples that show only the tip of the iceberg concerning the deaths of alternative healers.In fact, Dr. Fairbanks is the 77th holistic doctor or alternative healing practitioner to have died in just over two years.What makes the Fairbanks' death stand out is the harrowing nature in which the whole family has been killed.We could just play along and write these deaths off as another tragic "coincidence," because, after all, large pharmaceutical companies make medicines and vaccines so, surely, they "just want to help people," right? Unfortunately, these won't be the last deaths of people who go up against Big Pharma.The question now remains: Who will be next?